Unless done early and voluntarily, a Greek default would be triggered by an inability to borrow, and that inability will be linked to money that the Greek state would need to raise in order to roll over debt. Remember that when Greece received its bailout in May 2010 it was ahead of a bond due on May 19, 2010 that the government said it could not pay. That set the timing for the rescue package. The problem is that Greece’s amortization needs in 2012 are frontloaded, meaning that the moment of truth comes early in 2012. On March 20, 2012 to be exact. Greece has two expenditures for which it needs to raise funds: to finance its budget deficit and to roll over existing debts. To meet these, the government has three main financing options: privatizations, market borrowing and IMF/EC loans. From mid 2010 and in 2011, Greece met its needs by raising money in the short-term market and by borrowing from the IMF/EC. It did not need to raise money in the long-term market, where mistrust about the country’s ability to pay back debt has pushed up yields. That changes in 2012, however. According to the IMF, whose estimates will rise in lieu of a bigger than expected drop in GDP in 2010 and a smaller than expected drop in the deficit, Greece needs to raise €27 billion in 2012 from long-term bonds. This number is driven by a large amortization requirement: according to the IMF, in 2011 Greece needs to pay down €35.2 billion in long-term debts and €10.3 billion in short-term debts. The Ministry of Finance, which publishes the graph below, shows a 2011 repayment need of ~€40 billion. But when are these debts due? For now we can ignore the smaller amounts from short-term debts – these are usually €1-€2 billion and are unlikely to be the trigger of a default. Looking at long-term debts, 80% are due in the first half of 2012. Most worrisome are two 3-year bonds that are payable on March 20, 2012. Combined they account for over €21 billion. 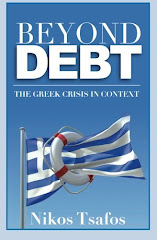 A third, 10-year bond for €8 billion is due May 18, 2012. We can therefore call March 20, 2012 Greece’s D-Day. If the Greek government continues to bet that it can avoid default, this day will be its ultimate test – the day by which Greece will need to convince markets to lend it another €21 billion. Can't they sell debt in the primarty market directly to the EFSF now? Wouldn't March's 'grand barbain' potentially give Greece more time?